(£150.00 PER WEEK) WITH ZERO BUSINESS RATES AT PRESENT. 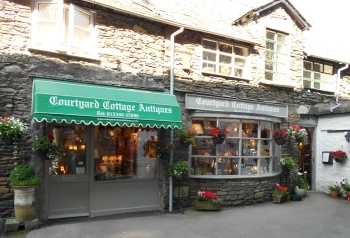 Welcome to Courtyard Cottage Antiques of Windermere, situated in the heart of the English Lake District. Established in May 2000 and set in a courtyard just off the Main Road, Windermere. 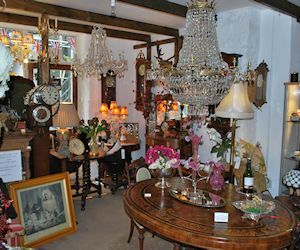 Courtyard Cottage Antiques displays an extensive range of antiques and collectables from various periods, our ever changing stock always features chandeliers, lamps, clocks, furniture, silver and jewellery. Courtyard Cottage Antiques is known for it's clocks, and there are always very good examples for sale from, French Carriage, to 'Black Forest Cuckoo', through to 'Grandmother' and 'Grandfather' (Longcase), plus a variety of affordable mantle clocks. We also offer a clock repair/restoration service. The shop is festooned with amazing chandeliers, Courtyard Cottage Antiques specialises in French and Italian crystal chandeliers. There are also displays of new and second hand diamond and precious stone rings and jewellery. 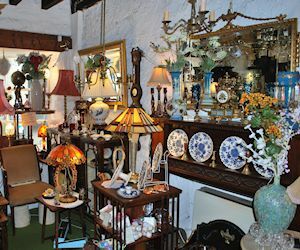 A visit to Courtyard Cottage Antiques, tempts serendipity, there is simply so many different and interesting items, you are most likely to find your 'gem' amongst their treasure. Courtyard Cottage Antiques are open Tuesday to Saturday ten am to five pm. Owner Jean French has a very good eye for antiques, and presents lovely collectables in a knowledgeable and pleasing way, the two rooms have a myriad of gems, superb chandeliers, Victorian diamonds, vases, mirrors, toys, furniture, chosen carefully and available for you.